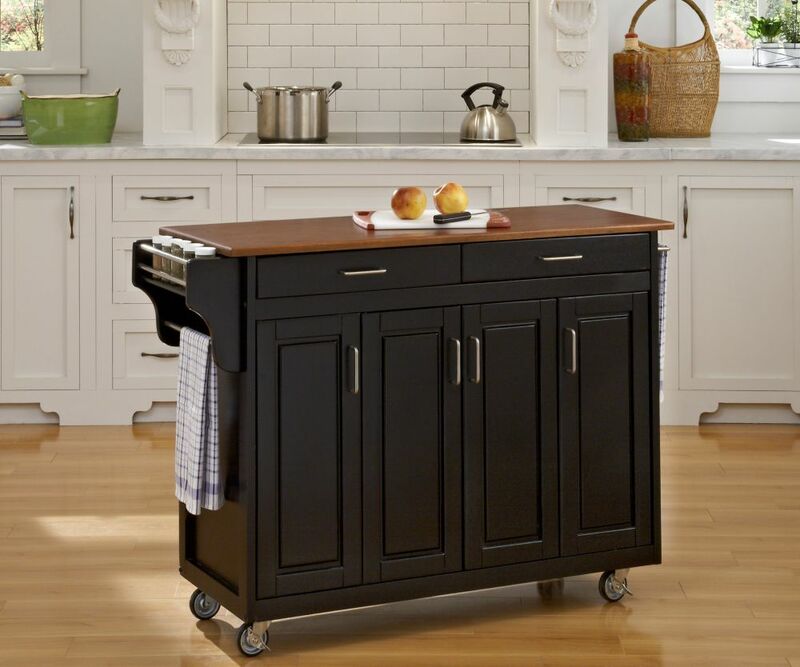 Home Styles Create-a-cart in a black finish with a 3/4 inch oak finished wood top features solid wood construction, four cabinet doors that open to storage with three adjustable shelves inside, handy spice rack with towel bar, paper towel holder, and heavy duty locking rubber casters for easy mobility and safety. Size: 48.75w 17.75d 34.75h. Assembly required. Home Styles Kitchen Island & Two Bar Stools are constructed of solid hardwoods and engineered wood with a rich Black finish and a distressed Oak finished top for an aged look. Island features include convenient drop leaf that raises to provide dining / serving space, antique nickel hardware, easy glide storage drawer, raised detail cabinet doors with adjustable shelves inside, and open storage on each end with an adjustable shelf. Size: 49.75w 26.5d 36.5h; with drop leaf extended island is 36d. 24h Bar Stool features distressed oak finished seat with a black finish. The Monarch Kitchen Island blends upscale design with state-of-the-art functionality. Stylish design features include a solid hardwood, distressed Oak finished top with profiled edges; framed side and back panels; and a , Antiqued White sanded and distressed finish over hardwood solids and engineered wood. Functional elements include two storage drawers and a storage cabinet with four adjustable shelves. What makes this island really unique is the hidden sliding mechanism connected to the back two shaped and turned posts. The mechanism provides easy mobility and independent movement of the two posts for expansion of the breakfast bar. The 15.5 inch breakfast bar extends the top surface from 25 inches to 40.5 inches. Either with the breakfast bar closed or in use, this piece has a polished look by being consistently styled on both the approach and working sides. The Monarch Kitchen Island with Two Stools features a profile edges top, framed side and back panels, and antiqued brass finished hardware. An oak finish over hardwood solids and veneers. Include two storage drawers and a two-door storage cabinet with four adjustable shelves. Patented sliding mechanism provides easy mobility and independent movement of the two legs for the extension of the breakfast bar. The Monarch Counter Stool projects striking style with sophisticated straights style solid legs and contoured seat. This stylish stool blends hardwood solids with a distressed oak finish. Seat height:24". Set includes Kitchen Island and two stools. Finish and measurements may vary slightly. Kitchen Island Size: 48x25x36. Kitchen Island Size with breakfast extended: 48x40.5x36. Stool Size: 18x21.5x41. Assembly required. U.S. Patented. Create-a-Cart Black Finish with Oak Top Home Styles Create-a-cart in a black finish with a 3/4 inch oak finished wood top features solid wood construction, four cabinet doors that open to storage with three adjustable shelves inside, handy spice rack with towel bar, paper towel holder, and heavy duty locking rubber casters for easy mobility and safety. Size: 48.75w 17.75d 34.75h. Assembly required. Create-a-Cart Black Finish with Oak Top is rated 4.6 out of 5 by 5. Rated 5 out of 5 by Christina from Easy to assemble and looked great! ... Easy to assemble and looked great! Rated 4 out of 5 by GCDepot from It did take some time to put together. It looks great and serves its purpose. We are happy with t... It did take some time to put together. It looks great and serves its purpose. We are happy with this purchase. Rated 5 out of 5 by Sharon from I absolutely love it! I searched awhile to find... I absolutely love it! I searched awhile to find the right cart, and this one is perfect! It looks good, is very sturdy and provides the additional space I need. I'm very happy with this purchase. Rated 5 out of 5 by Christopher from Solid. Easy to assemble. ... Solid. Easy to assemble.